ESD Waste2Water equipment is recognized as a worldwide leader in industrial wastewater treatment systems and environmental remediation. Ultimate Washer is committed to helping customers obtain industrial equipment, vehicle and parts washing operations that are effective and environmentally friendly, whether you need to recycle the wash water, or treat it and discharge to the sanitary sewer. We can supply the equipment for these needs as well as arrange for installation and service environmental protection systems for clients across the United States, Canada, Europe, South America and Australia. Ultimate Washer is proud to offer this product line for a mutual goal of a cleaner environment Using a fixed-film biological treatment system, these units have been proven to rapidly degrade organic contaminants (oil, grease, gasoline, diesel fuel, herbicides and pesticides). The Waste2Water treatment systems are commonly used as stand-alone totally closed-loop wash water recycling systems. Other common applications include pretreatment to discharge and enhanced natural attenuation at contaminated sites. Systems can be customized to meet specific site conditions. Some typical applications are Golf and Turf Industries, Equipment Rental Yards, Municipal, Industrial and Rental Fleets, Oil and Gas Industries, Heavy Equipment, Aggregates, Trucking, Agricultural Equipment, Food Processing Groundwater and Soil Remediation. The modular Pressure Island VIPIR system is designed to clean and pre-treat metal parts with heated phospatizing solution in preparation for powder coating and painting operations. It recycles the phosphatizing solution for up to 90% recovery. Provide a fresh water rinse cycle for final preparation of metal parts. Certified to UL -508A Standards. 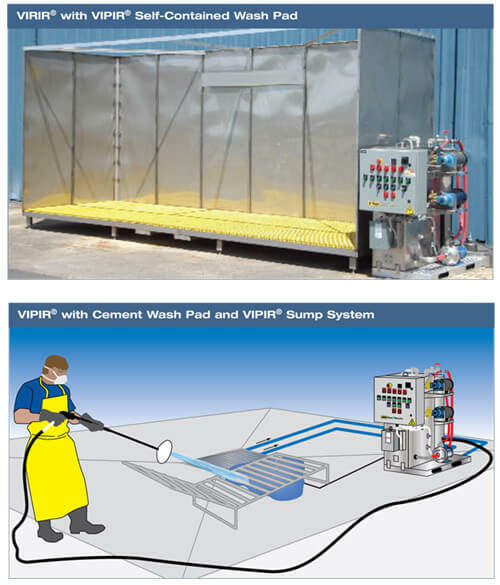 Available Options: Oil Skimmer, VIPIR Sump System (for cement wash areas) includes stainless steel sump and (2) pumps, or as a VIPIR self-contained wash pad in either 6’ W x 18’ L or 6’ W x 12’ L with 8’ walls. 200 lbs per square foot load capacity on self-contained wash pads. Choose one option below with Module. With a talented service team that is second to none, Ultimate Washer can arrange the installation and service of your wastewater treatment systems to maximize the operation and performance. Installation, Start Up and Training is necessary. Clean and pre treat metal parts with heated phosphate solution in preparation for powder coating and painting operations. Recycle the phosphate solution for up to90% recovery. Provide a fresh water rinse cycle for final preparation of metal parts. All of this in one, compact unit. 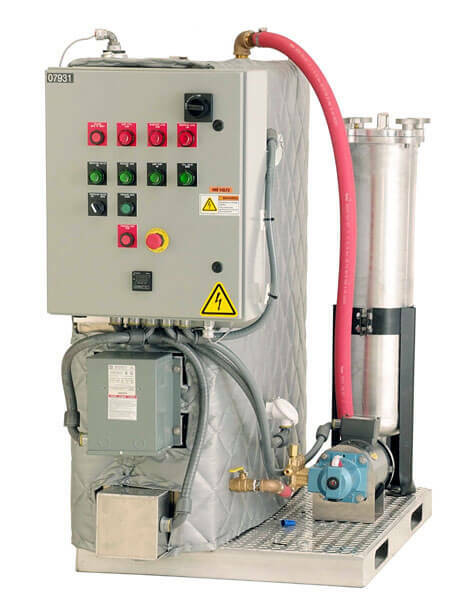 The VIPIR system can be incorporated with your current wash operation, designed as part of a new wash operation, or be combined with a VIPIR pad for a stand-alone wash system. All of this in one, compact unit. The VIPIR system can be incorporated with your current wash operation, designed as part of a new wash operation, or be combined with a VIPIR pad for a stand-alone wash system.